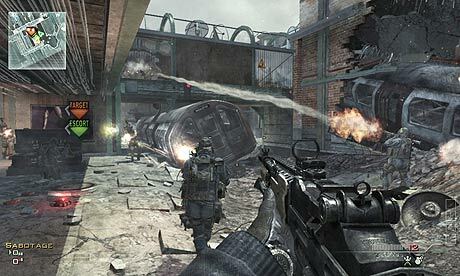 Call of Duty: Modern Warfare 3 has attracted near-universal critical acclaim. It is a slick, well-constructed and generously proportioned instalment in one of the most revered military shooter franchises in history. There is just one problem. Everyone on the internet hates it. Soon after the game’s release on Tuesday, savage user reviews began to appear on score aggregation site, Metacritic. A flood of 0/10s outnumbered ecstatic 10s and considered 7s and 8s by a dramatic margin. Currently, for the Xbox 360 version of the title, the average user score for one of the biggest entertainment releases of the year stands at a wretched 3.0. On PC it’s 1.7. The first point, of course, is that it’s dangerous to think of these outbursts as being in anyway representative of the majority opinion. “On day one or two, you are going to get a vocal minority who take to the forums on Metacritic and use them as a soap box to vent their rage about the series,” says Daniel Krupa, a writer at games site, IGN. Don’t believe the marketing hype, this is the same product rebundled let it die and show investors we’re not interested in being sold the same product year after year, the cash cow needs to starve. This represents an interesting reversal of the usual critic/public relationship. Often, it is the paid reviewer who despairs at the lack of originality in mainstream entertainment, while paying customers accept the formulaic in their droves. Let’s face it, Hangover 2 is basically a map pack for the first movie, yet it grossed almost $140m in its opening weekend and at 5.7 its Metacritic user review average is higher than the critical metascore. As human beings we enjoy systems and repetition – our brains actively seek them out; it is a survival instinct that has morphed into an unconscious entertainment preference. Hence, the vital role of the catchphrase in comedy; hence, the predictable conventions of our favourite horror flicks. The notion of the sequel is based on the usually accurate construct that we like to relive enjoyable experiences. Modern Warfare 3 gives us more of what we liked, because we generally like more of what we like. But is this game just too similar to previous iterations? Certainly, there are a lot of familiar weapons, and a lot of perks and killstreak rewards that we’ve all seen before – yet similar criticisms could be levelled at the inventories of, say, Mass Effect 2 or Gears of War 2, and elements like the new strike packages do add a significant tactical thrust to the action. Elsewhere, there are complaints that the campaign is based around the same old linear action and explosive set-pieces as its predecessors. But then, what did everyone think was going to happen? “I think ultimately Modern Warfare 3 should be ranked alongside Fifa and other sports games in as much as, it’s better than last years, but it will deliver a very similar experience. People say they want innovation and change and difference, but in the same way that Fifa can’t break out of the fact that it’s a game of football, CoD is so successful now, it can’t really break out of its model, it is constrained by its very form. If you consider it as a sports game it becomes more logical. Rivalry has also played a part in the tribalism of the user reviews. 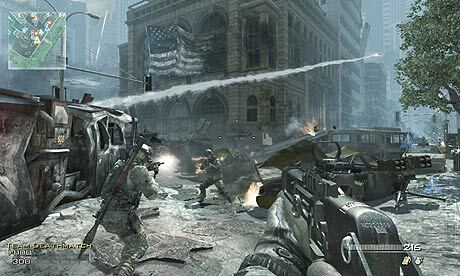 EA has pitched its Battlefield 3 title very much against Modern Warfare, both in its advertising and in some barbed pre-release interviews – and this has fostered a factional atmosphere: gamers love a platform battle. And here we unearth a more insidious undercurrent: Activision (NSDQ: ATVI) is being actively punished. Last year, the co-founders of Infinity Ward, Jason West and Vince Zampella, were sacked for breaches of contract and “insubordination”. 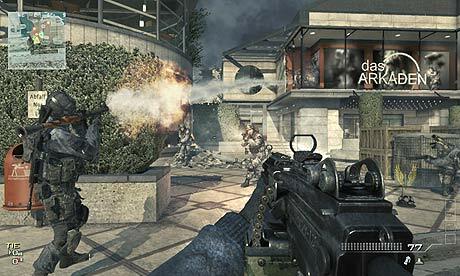 The duo immediately sued the publisher, claiming that millions in royalties were being withheld from Infinity Ward staff.Activision later counter-sued suggesting that West and Zampella were using the company’s IP to broker a development deal with a rival company. Later, the dismissed twosome set up Respawn Entertainment and announced a publishing contract with EA, Activision’s main rival.Now, I’ve read through the papers submitted by both parties. They make complex claims and counter claims and it looks as though it is going to take many months for a US court to get to the bottom of what is an intricate corporate law case. The point is, as it stands, no one outside of the Infinity Ward or Activision knows what happened. No one, that is, except for the internet, which has sided with West and Zampella against Activision. “[Modern Warfare 3 is] being published by Bobby Kotick, AKA ‘the devil from Activision Blizzard who eats game developers for breakfast’, so I subtracted points for that,” wrote one Metacritic reviewer, who gave the game 0/10. Even if something dark and unjust did happen at Infinity Ward, we enter troubling critical territory when the wrongs of the author, the studio or the distributor are visited upon the appraisal of their work. Movie history is littered with despicable characters who have made astonishing films; is Melancholia any less of a work because Lars von Trier claimed to be a Nazi during his Cannes press conference? And let’s not get started on Roman Polanski, Elia Kazan or Walt Disney. Tying in with the contempt for Activision is a distrust for the reviewers themselves. Several comments beneath my own review for Modern Warfare 3 had to be removed because they were essentially libellous. “I think it’s representative of a wider distrust of corporations,” says Hicks. “There’s a cultural suspicion of large companies and manipulation. And this has happened hand-in-hand with the rise of the internet and the democratisation of opinion. It’s something of a farcical accusation. As one reviewer tweeted last night, games publishers barely trust us to take our own screenshots any more let alone keep quiet a widescale attempt to fraudulently secure favourable review scores. Furthermore, Call of Duty is perhaps the one entertainment brand in the world that doesn’t need critical acclaim to ensure success. Clearly, though, the 0/10s are a protest against something because these comments do not function as criticism. “This game is average at best,” writes one Metacritic user before awarding MW3 1/10. That’s a quite staggering mathematical failure. But like other reviewers, I suspect, I wrestled with how to score Modern Warfare 3. It isn’t innovative, it isn’t original, but it is ruthlessly compelling and packed with content. I am thoroughly enjoying it. I am curiously heartened by this. I’ve contributed toward the problem, of course, by awarding Modern Warfare five stars – a decision I stand by. But I am also a huge fan of indie and art games; I was transfixed by Robin Hunickie’s explanation of thatgamecompany’s beautifully strange Journey at GameCity just a week before I reviewed MW3. I want new, innovative games too. It could be that gamers are undergoing a process of genre fatigue; it might be something to do with this console life cycle coming to an end. A sort of fin de siècle ennui. At the very least, The Elder Scrolls V: Skyrim is out on Friday. A vast, ambitious RPG that seeks to create an infinite number of quests, which will embrace every individual gamer. Is it sufficiently different from Elder Scrolls IV? Does that matter when ambition and scale are such a major part of the package? How do we approach that paradigm as reviewers? One thing there mustn’t be is an irreparable disconnect between game journalists and game buyers. We should be in this together – if we’re not communicating about games in the same way, something quietly terrible has happened. This article originally appeared in Guardian.co.uk.